Contact your vendor for more information. 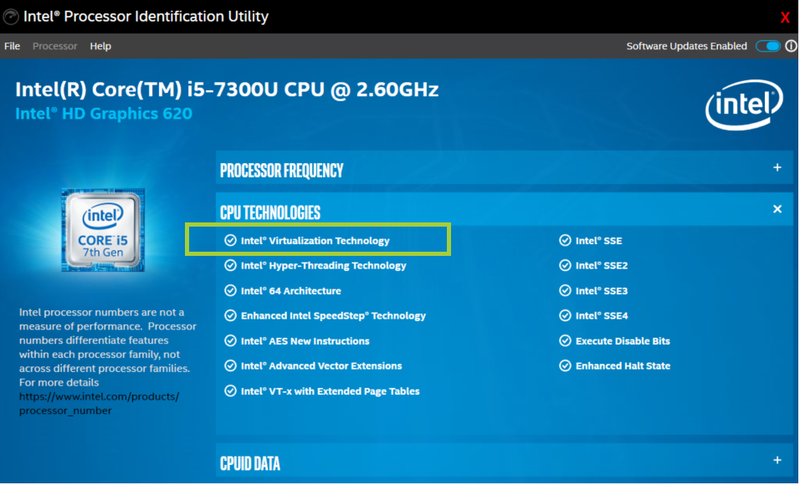 Determine your processor number: Refer to How to Identify My Intel® Processor? Press the Windows key and the letter S at the same time. Make note of your processor number, located under Processor. Visit the product specification site (ark.intel.com). Enter the number of the processor in the search box located on the right side. In the processor product page, and under Advanced Technologies, check to see if Intel® Virtualization Technology (VT-x) is supported. Enter the number of the processors in the search box. On the specification page for the processors, and under Advanced Technologies, look for the Intel® Virtualization Technology (VT-x) field. The Intel® Processor Identification Utility can be used to check if the Intel® Virtualization Technology is supported in your processors. Download the Intel® Processor Identification Utility, install, and run. Double-click the Intel® Processor Identification Utility on the desktop to open. Select the CPU Technologies tab. A processor with Intel® Virtualization Technology doesn't guarantee that virtualization works on your system. Intel® Virtualization Technology requires a computer system with a chipset, BIOS, enabling software and/or operating system, device drivers, and applications designed for this feature. If your BIOS includes a setting to enable or disable support for Intel® Virtualization Technology, make sure you enable it. This article applies to 60 products.